SHEERWATER pulled the rabbit out of the hat when Timmy Taylor scored an 85th-minute winner to defeat Epsom & Ewell on Saturday. It was ‘Sheer delight’ for boss Pete Ruggles, whose side continues to impress after snatching all three points at High Road; beating The Salts 3-2 in the two sides’ first meeting since 1975. Still invigorated from their midweek win against AC London, Sheerwater travelled to Epsom looking to extend a nine-match unbeaten run in all competitions. However, it wasn’t all plain sailing for Ruggles, who was forced to stand in for keeper Andy Rider; while Jamie Doble, Scott O’Connor and Alex Headland all missed out through injury. 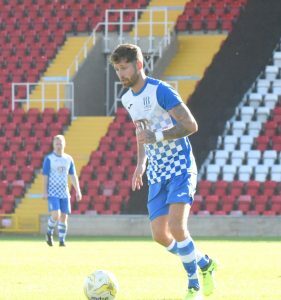 In contrast to recent weeks, the visitors didn’t get off to the best of starts and found themselves chasing the game as early as the second minute when Olly Martinez turned in a low cross following a long throw-in. The Sheers got their noses in front, thanks to goals from Hegarty and Machay. It was all square again, though, just three minutes after the break when Ruggles allowed Endrit Dobraj’s scuffed shot to dribble through his legs and into the net, much to his dismay. As the match moved into its closing stages, Taylor smashed his shot into the roof of the net to give The Sheers a deserved win.